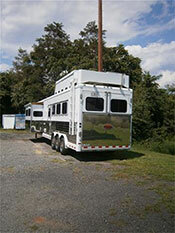 Our 2004 Sundowner Model 727 6 Horse, Guess-N trailer is a horse trainer’s delight. 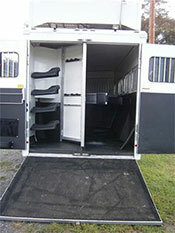 This six horse trailer features a small living package. 6' short wall with 3 bunks, overhead cabinets, & TV in each bunk. 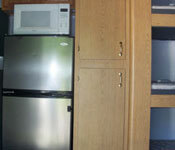 Also has 6cf refrigerator, microwave, Satellite TV and Air Condition. 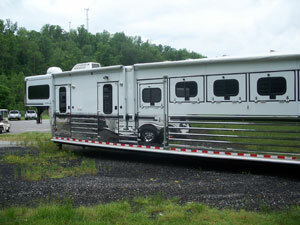 It is 7'6" tall, has stainless steel sides & nose, mid-tack, rear tack, drop down windows, face guards w/screens, stud divider, 3 awnings, electric jack, hay rack, aluminum wheels, 8 bar blanket tree, 8 saddle tree, extra bridle hooks, one stud divider, loading lights and doors on both sides of the mid-tack. 2009 Sundowner 725 4 Horse Signature Series Living Quarters! This trailer is 8’ wide and 8’ tall, it features a 10’ slide out, stainless sides, nose, and rear ramp, as well as a stainless enclosure under the gooseneck. There are dual hydraulic jacks, drop down feed doors on rear side of trailer. There is a 10’ covered hay pod, 18” open walkway behind pod, roof mounted generator and 50 gallon water tank with pump on the walkway. Double aluminum battery box, Clear LED lighting, LED strip lighting in horse area, face guards at horse’s heads, electric over hydraulic disc brakes WITH air ride!! This trailer has solid distressed maple interior, 15,000 BTU ducted AC & Heat, 4,000 Watt Onan micro-quiet generator, a self-seeking satellite, convection oven and microwave combination, washer and dryer combo, two 40 lb. LP tanks, Soft walls and ceiling, round marble shower, central vacuuming system, fireplace, 4 two-way radios with charger, recessed cook-top, 10 cu. ft. refrigerator with ice maker, wood cover package on all ceiling appliances, solid granite countertops- kitchen and bathroom! There is also a tin backsplash in the kitchen, black toilet, upgraded slide-out pillar fascia. There are also two TV’s and a surround sound entertainment center. 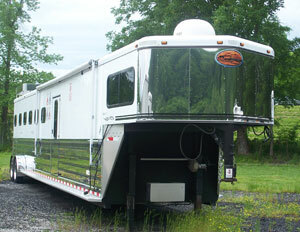 This trailer also features an on demand hot water system.